"I like that working with my hands, I can do something and see a finished product." The ability to see something from beginning to end, to see a project that is done, is one of the things Jeff loves about woodworking, finishing, painting. A Problem Solver, Specialized in Custom Paint & Stain color matching, Jeff has a passion for all things wood, coatings, & finishes. Jeffs interest in woodworking and finishing techniques began at an early age. Inspired by his High School shop teacher and overall shop class experience, Jeff made a career working in the Paint/Hardware Industry for the last 30+ years. For 25 of those years Jeff has been working with and selling General Finishes. 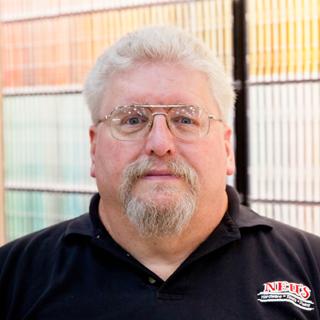 15+ of those years he has been contributing his expertise working at Neus Building Center, Inc.
Neus Hardware has been serving the Community and the Construction industry with Quality Hardware, Tools, & Paint since 1945. Today, Neus Building Center is recognized by manufacturers both nationally and internationally as an integral part of their distribution chain linking the manufacturer with the skilled consumer.